Oakville Chiropractor: Is Your Pillow Hurting You? Is Your Pillow Hurting You? The weather lately has given us an excuse to stay in bed. 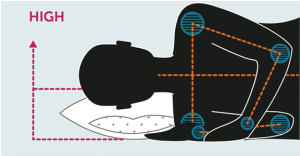 So now might be a good time to review proper sleep mechanics – starting with our pillows. Our Oakville Chiropractor recommends a firm supportive pillow that works with your body. If you are waking up with neck pain or headaches then it may be time for a new and improved pillow! We are often asked about which pillows are best. The answer is – it depends. It depends on the position you sleep in most often. A good pillow should support your spine and keep it in a neutral position while you sleep. In other words, you want the spine to be as straight as possible. This means that your ideal pillow will depend on if you’re a stomach, side or back sleeper. SIDE SLEEPERS: Many of us sleep on our sides. There are a hundred different variations of side sleeping positions, but the pillow height should be the same for all of them. Side sleepers need the most height from their pillows to properly support their necks. Ideally a thickness close to the same length as the distance from your ear to the side of your shoulder. A firmer pillow is also a good choice and will help to keep you supported throughout the night. BACK SLEEPERS: Your pillow doesn’t need to be quite as high as side sleepers, but you do need a moderately thick pillow to adequately support your head. Make sure the pillow is tucked all the way down to the base of your neck so that your whole neck and head are supported. STOMACH SLEEPERS: This is the least desirable position for your spine, however stomach sleepers are a stubborn bunch and it’s hard to break old habits. If you are a stomach sleeper, you need a thin but supportive pillow. Stomach sleepers can get away with using a soft pillow, or even no pillow at all! The firmness of your mattress may also impact the firmness of the pillow you use. If your mattress is soft you may need a firmer pillow and vice versa. As a general rule, it is recommended that pillows be replaced every 18 months. They get roughly 2500 hours of wear and tear every year, so make sure you check to make sure they’re still supporting you the way they should. If they are stained, yellowing or if the cases are ripping – it’s time to throw them out! Another easy way to tell is if you fold them in half and they don’t spring back. If they stay crumpled – you need a new one. If your terrible pillows have been giving you neck pain or headaches, come visit us at the clinic!